Is your game still loading this URL? html5.api.gamedistribution.com/libs/gd/api.js, then do be aware that this is a legacy integration. However; the new SDK is backwards compatible, so no development action is required. Nonetheless make sure your game is still working properly on the Gamedistribution.com platform or upgrade your implementation to the new spec. Implement the following snippet within your game or within the <head> section of your index.html. The GD_OPTIONS object is safe to obfuscate if needed. Make sure that the SDK is loaded before your game starts or while your game is loaded for the best user experience. Not after, and especially not by clicking a button within the game, as then it will take too long for an advertisement to load; making the user wait. Only load the SDK once! Make sure to add your game hash (gameId), which you can retrieve from your Gamedistribution.com control panel. Invoke a method to pause AND mute your game within the SDK_GAME_PAUSE event. Will be called every time a video advertisement is ready to play. It is important that the game is muted, as background audio through video advertisements is forbidden. Invoke a method to resume your game within the SDK_GAME_START event. Will be called every time a video advertisement is done playing. Now everything should be set up for you. All you need to do now in order monetise your game is to call gdsdk.showBanner() at the appropriate time in your game. This showBanner() call should be behind a touchUp/mouseUp event in order to work correctly on mobile and adhere by the ad rules. Note: Make sure to check if the gdsdk instance exists and the showBanner method exists as well. In case the SDK script goes offline or when adblocker stops it for whatever reason. Its just good practice when it comes to using third-party solutions. A lot of developers miss out on a lot of revenue by not calling so-called mid-roll advertisements. Do know that you can call the gdsdk.showBanner(); method as often as you want. We make sure its not possible to call too many ads after another in order to uphold a proper user experience and advertisement guidelines. 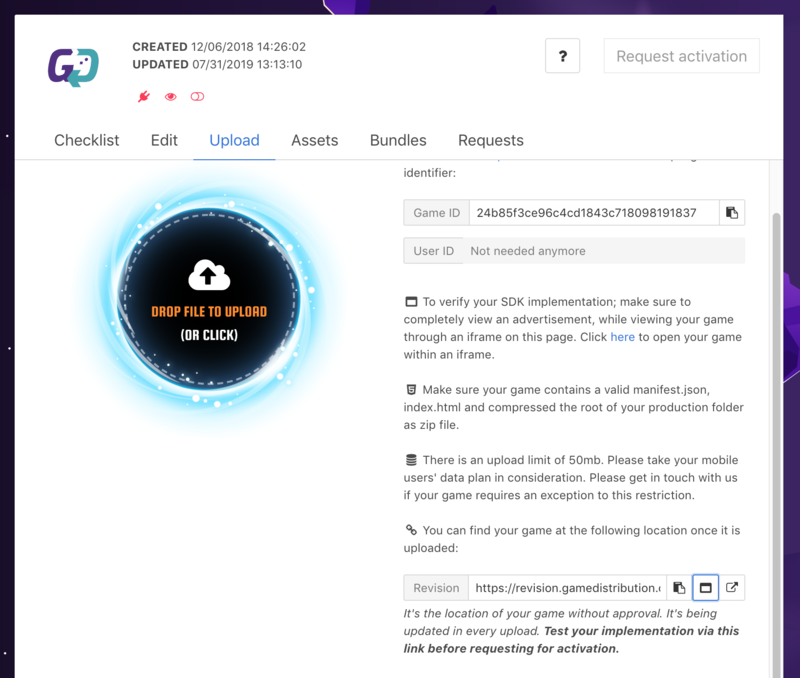 To activate your SDK integration you will need to upload your game first (https://developer.gamedistribution.com/) and make sure you have uploaded your game. You'll find your uploaded game URL at the bottom of the upload view within this admin. Here you'll also find a button to open your game within an iframe. Click this button. You must completely view your new in-game pre-roll advertisement once, from within this iframe. Doing this will activate and verify the integration. Your game will be flagged to have a valid integration of the SDK and your game can be requested for publishing. Please contact support if you're having any trouble concerning this step. Go to the upload view, and after uploading your game, open it in an iframe by clicking the indicated button. 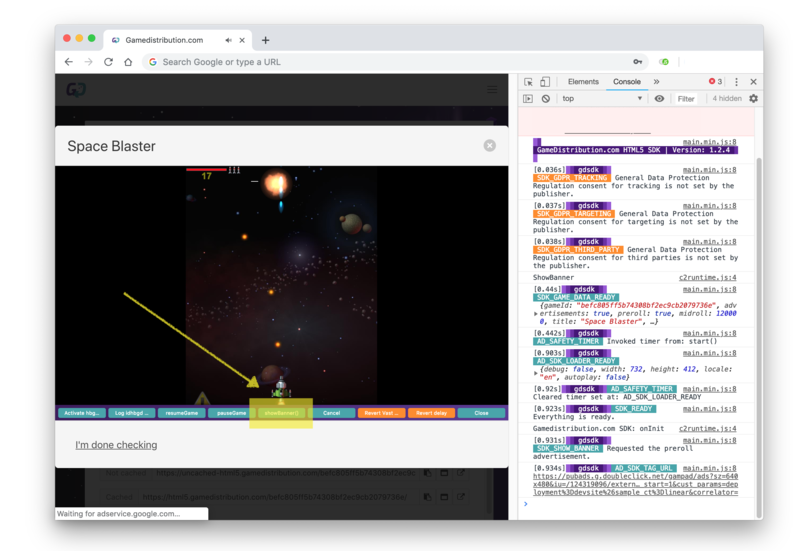 Your game will open within an iframe and a debugging bar will be displayed on top of your game. A demo VAST tag for calling a fake advertisement is already enabled, so you only have to click the "showBanner" button, in order to request an advertisement. Make sure you disable your ad blocker. This VAST tag has a 99% fill rate, so if you don't get an ad, check your console log and either resolve any reported issues within your games, or if you can't fix it, contact our support team. Make sure you completely watch the fake advertisement. Once the CONTENT_RESUME_REQUESTED event is triggered - without cancelling the advertisement - your game its SDK implementation will be approved. This can currently take up to a full day. This will open a tiny toolbar, which allows you to call fake advertisements, making the implementation much easier and reliable. Clear your localStorage to disable debugging. gameId our gameId which is unique for each one of your games; can be found at your Gamedistribution.com account. prefix Set your own prefix in case you get id conflicts. advertisementSettings Accepts an object of ad specific options. "prefix": "awesome__", // Set your own prefix in case you get id conflicts. "debug": false, // Enable IMA SDK debugging. "autoplay": false, // Don't use this because of browser video autoplay restrictions. "locale": "en", // Locale used in IMA SDK, this will localise the "Skip ad after x seconds" phrases. 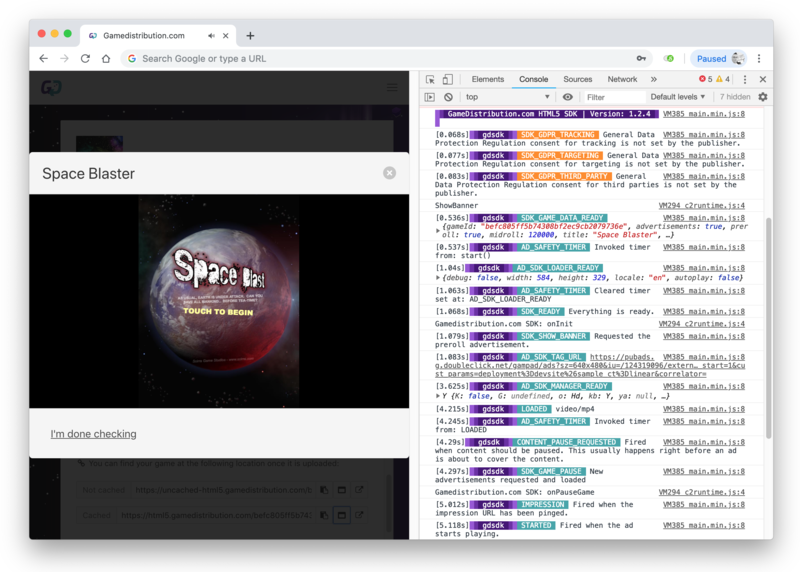 The SDK events should be used to start or pause the game or handling critical errors. Unless the errors are ad related, then hook into the AD_ERROR event, however; the SDK should gracefully fail and always calls SDK_GAME_START on any error, so this should not be needed. SDK_READY When the SDK is ready. SDK_ERROR When the SDK has hit a critical error. SDK_GAME_DATA_READY When game data is returned. SDK_GAME_START When the game should start. SDK_GAME_PAUSE When the game should pause. SDK_GDPR_TRACKING When the publishers' client has requested to not track his/ her data. Hook into this event to find out if you can record client tracking data. SDK_GDPR_TARGETING When the publishers' client has requested to not get personalised advertisements. Hook into this event to find out if you can display personalised advertisements in case you use another ad solution. The SDK events are custom ads for handling any thing related to the IMA SDK itself. AD_SDK_MANAGER_READY When the adsManager instance is ready with ads. AD_SDK_REQUEST_ADS When new ads are requested. AD_SDK_ERROR When the SDK hits a critical error. AD_SDK_FINISHED When the SDK is finished running the ad. AD_CANCELED When the ad is cancelled or stopped because its done running an ad. AD_SAFETY_TIMER When the safety timer is cleared. We run this timer to make sure the SDK and ads do not stop us from starting the game after, whenever there is a weird error. The Gamedistribution.com SDK uses the IMA SDK for HTML5 for loading ads. All events of this SDK are also available to the developer. AD_ERROR When the ad it self has an error. AD_BREAK_READY Fired when an ad rule or a VMAP ad break would have played if autoPlayAdBreaks is false. AD_METADATA Fired when an ads list is loaded. ALL_ADS_COMPLETED Fired when the ads manager is done playing all the ads. CLICK Fired when the ad is clicked. COMPLETE Fired when the ad completes playing. CONTENT_PAUSE_REQUESTED Fired when content should be paused. This usually happens right before an ad is about to cover the content. CONTENT_RESUME_REQUESTED Fired when content should be resumed. This usually happens when an ad finishes or collapses. DURATION_CHANGE Fired when the ad's duration changes. FIRST_QUARTILE Fired when the ad playhead crosses first quartile. IMPRESSION Fired when the impression URL has been pinged. INTERACTION Fired when an ad triggers the interaction callback. Ad interactions contain an interaction ID string in the ad data. LINEAR_CHANGED Fired when the displayed ad changes from linear to nonlinear, or vice versa. LOADED Fired when ad data is available. LOG Fired when a non-fatal error is encountered. The user need not take any action since the SDK will continue with the same or next ad playback depending on the error situation. MIDPOINT Fired when the ad playhead crosses midpoint. PAUSED Fired when the ad is paused. RESUMED Fired when the ad is resumed. SKIPPABLE_STATE_CHANGED Fired when the displayed ads skippable state is changed. SKIPPED Fired when the ad is skipped by the user. STARTED Fired when the ad starts playing. THIRD_QUARTILE Fired when the ad playhead crosses third quartile. USER_CLOSE Fired when the ad is closed by the user. VOLUME_CHANGED Fired when the ad volume has changed. VOLUME_MUTED Fired when the ad volume has been muted.